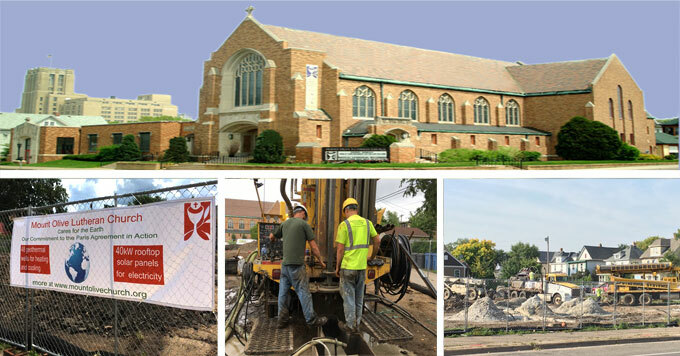 The Mount Olive Lutheran Church in Minneapolis installed a heating and cooling system powered by geothermal energy. Mount Olive Lutheran Church undergoing construction for the transition to a geothermal heating and cooling system. Photos: Courtesy of Arthur Halbardier. In its 90-year history, Mount Olive Lutheran Church in Minneapolis has never had air conditioning. That’s Art Halbardier, the church’s property director. He says members were hesitant to install an energy-intensive air conditioner. But their heating system was also outdated, so they decided to find a responsible way to renovate. Their search led to geothermal, an energy system that draws on stable underground temperatures to efficiently heat and cool buildings. Some members were concerned that the system’s high cost would divert resources from community service. The geothermal system was installed this past fall, and members can now worship in comfort year-round. Climate Connections is produced by the Yale Center for Environmental Communication. Learn more at http://www.YaleClimateConnections.org.